The color scheme for this suit is the skirt of a fine blue/green/ivory plaid with the buttons covered in ivory linen. The same linen is used for the lining of the blouse. It's also the same linen I used for the underthings, so as you have probably already guessed, I had quite a bit of ivory linen! I purchased it from another costumer for a great price and love the color. It is very delicate, however, and so I've also purchased an ivory muslin to interline the jacket. 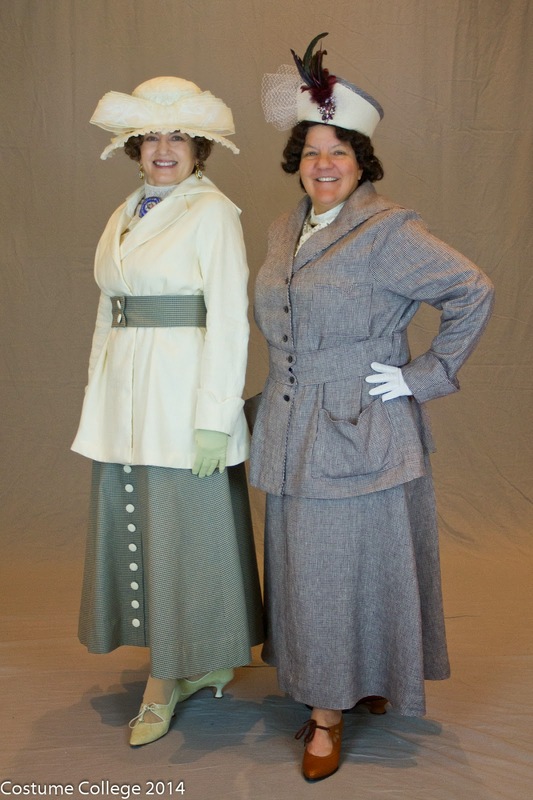 In this photo you can see the unlined linen on the left and the linen lined with muslin on the right. The muslin also turns out to be great for the structure of this jacket. The first step then, because of my fabric choice, is to interline every panel with muslin, sewing inside the seam line along all edges. Here are all the pieces cut from the linen and the muslin and the finished belt made from the same fabric as the skirt with the same linen covered buttons. The pattern is very straightforward simply sewing side seams, cuffs, and a front collar facing. I drape the pieces on my dressform as I sew to view the placement of the collar and to test button placement on the cuffs. There is such an opportunity for creativity with this pattern for cuffs, collars, pockets, buttons, and belt! My version is a bit simple in its use of combined fabrics for the jacket as my plan is to make another skirt and belt from a persimmon-colored fabric and I will be able to use the jacket again. I've chosen to add interest to the jacket with the pleated collar. It is simple to sew and although the attachment was a bit confusing for me at first, I simply stitched it completely through the jacket and then covered the attachment with a bias tape. The jacket looks HUGE when complete! It is a lot of fabric but when belted the shape is really flattering and the jacket hem flares the same way as the skirt hem. It's a beautiful look! I love the clean, simple lines of the suit with the over-the-top laced and feathered and flowered and bowed and pearled hat! The addition of some mini-mosaic earrings and a pin put another bit of color to the costume and added the perfect touch! 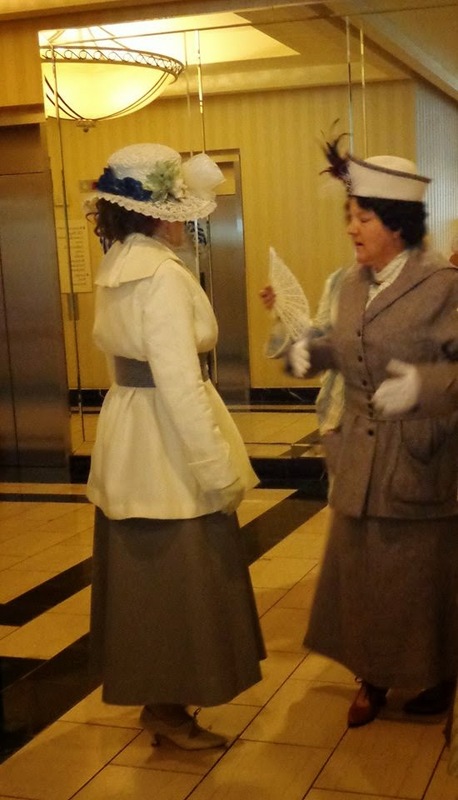 It was exciting to complete this costume in time to wear to the Royal Ascot Tea at Costume College 2014. 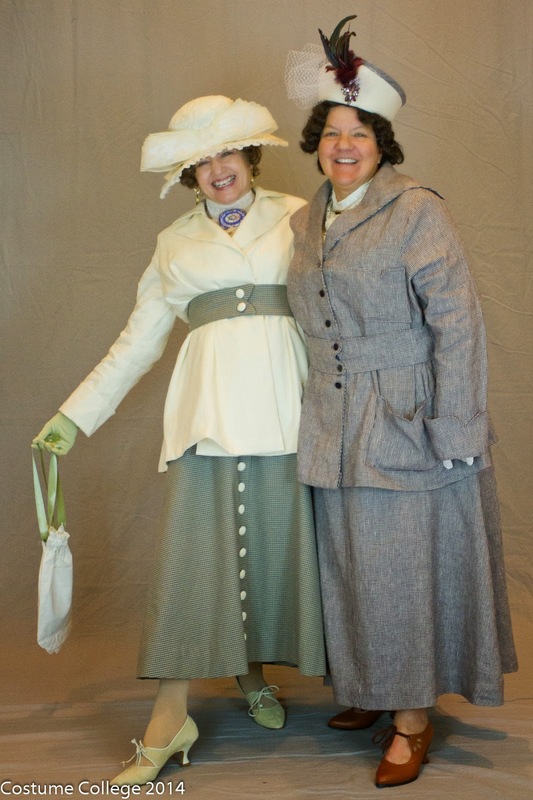 My friend and Costume College roommate, Kay, made her Wearing History 1910s suit in a gorgeous plum checked linen and we had a wonderful time together! In late September I attended a costume event in Pennsylvania - Steampunk unLimited at the Strasburg Rail Road. Since we were so close to Winterthur Museum in Delaware and the Downton Abbey Costume Exhibit, we took a morning drive and toured the exhibit in costume. My good friends Sharon, Mike, and Randi having a glorious day! I hope you've enjoyed the journey into a new era for me and a new pattern for Wearing History! Very lovely! I like how you did not use buttons down the front of the jacket .... gives it a classy look when belted. Well done, Jeanette!!! Thank you so very much, Diane! Oh Jeanette! I LOVED this dress when I saw it at Coco!! You did such a fantastic job on it and inspired me to make mine. Wasn't sure how I would like the fit of this era as it is a new one to me, but it was so awesome on you! And I LOVED the fact that you used the two buttons on the jacket...too cool! Oh! And your corset is yummy!!! Job well done! Thank you, Gina! I wasn't sure about the fit either but it has become one of my favorite costumes! Looking forward to seeing your creation!